Stealing Febreze From Dollar Store Caught On Camera. Dollar stores seem to be a breeding ground for all sorts of interesting characters. I mean there’s usually certain types of people that tend to have a budget that ranges up to one dollar per item. Well this video isn’t even about those types of people. It’s about the type of person that can’t even spend one dollar on an item, so they end up trying to steal from a dollar store… and get caught by the store manager that has no problem calling you out on your ridiculousness. 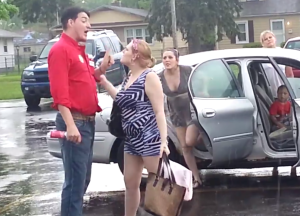 The video starts with the manager of a Family Dollar store yelling at a woman over stealing a can of Febreze. The woman of course denies the accusation but the manager insists that she did. Then his attention gets pulled away from the initial argument when one of the children in the car “disrespects” him. Once this happens he seems to not even care about the Febreze and gives the women in the car a lecture about how to raise their children to respect their elders. This mixed with the crazy personalities that present themselves throughout the video and a little spray of Febreze to the face makes this video more than worth watching. I mean the woman that got sprayed in the face literally compared it to being maced.